A disillusioned soldier. A spoiled, untried prince. A coup that threatens the country they both love. When retired soldier Kemen finds the young prince Hakan fleeing an attempted assassination, he reluctantly takes the role of mentor and guardian. Keeping the prince alive is challenging enough. Making him a man is harder. As usurper Vidar tightens his grip on power, Kemen wrestles with questions of duty and honor. What if the prince isn’t the best ruler after all? Invasion looms, and Kemen’s decisions will shape the fate of a nation. What will he sacrifice for friendship and honor? The King’s Sword takes place in the mythical land of Erdem. I imagined the main character, Kemem Sendoa, as an old man sitting by the fire, reciting his story of adventure to his grandchildren. As the story begins, Kemem has been released from the kingdom’s military and is wandering the countryside alone. He encounters a teenage boy, who is under dressed for the cold weather and alone. This happens to be no ordinary boy, but the prince, Hakan Ithel. Hakan is on the run. His father, the king, is dead and someone has put a price on the prince’s head. He barely escaped the palace with his life. Now, a strange and dangerous looking man is offering his protection. Can Hakan trust him? As the story progresses, we get to know Kemem’s back story; how he came into military service and why he had to leave. He’s had a hard life, but that did not make him bitter or resentful. He is a sworn protector of the king, and now he is charged with protecting the prince and seeing him back to his rightful place, the throne. It’s not an easy task, with an untested prince and many people out to kill him. But Kemem does an admirable job of taking the boy under his wing and turning him into a man. 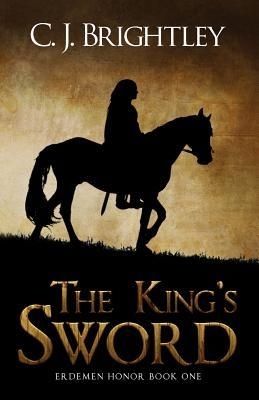 The King’s Sword was an interesting story, which moved at a slower pace than what I’m used to. That wasn’t necessarily bad, because I really got to know Kemem and grew to like him. I thought the author did a good job of world building to bring the reader along on an epic adventure. This entry was posted in blog, Book Review by Laurie Winter. Bookmark the permalink.